Jobs don't fit in neat little boxes. 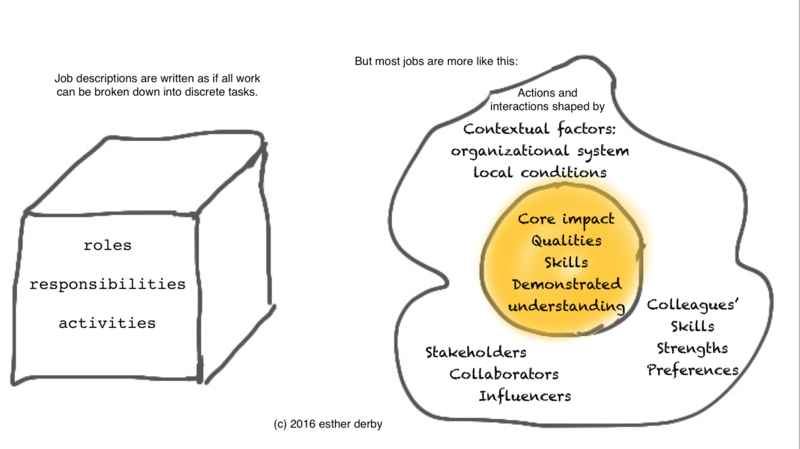 - esther derby associates, inc.
Jobs don’t fit in neat little boxes. Most job descriptions decompose work into discrete chunks, clearly defining what each position must do. Competency models list required behaviors, seeking standardization across contexts. In essence, these models are akin to specifications for machine parts. Complex knowledge work isn’t like that. I prefer to think about jobs in terms of the work, impact on the organization, context, relationship, and collaboration. There’s a core of qualities, skills, experience, and demonstrated understanding necessary for the work. Context shapes what’s actually required to do the job and have an impact on the organization. Sort of like a fried egg. Doesn’t fit in a nice neat box, but closer to reality.